Good morning on another hot hot hot day here in the UK. 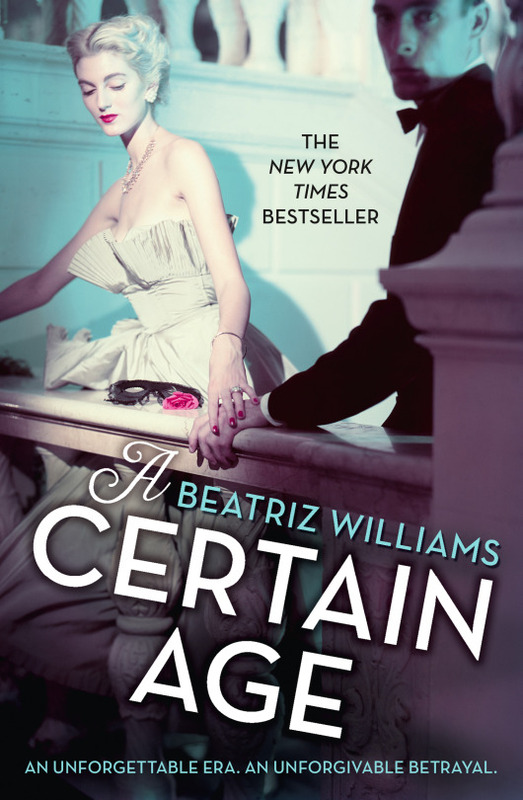 It’s my pleasure today to be part of the blog tour for Beatriz Williams’ new novel A CERTAIN AGE. 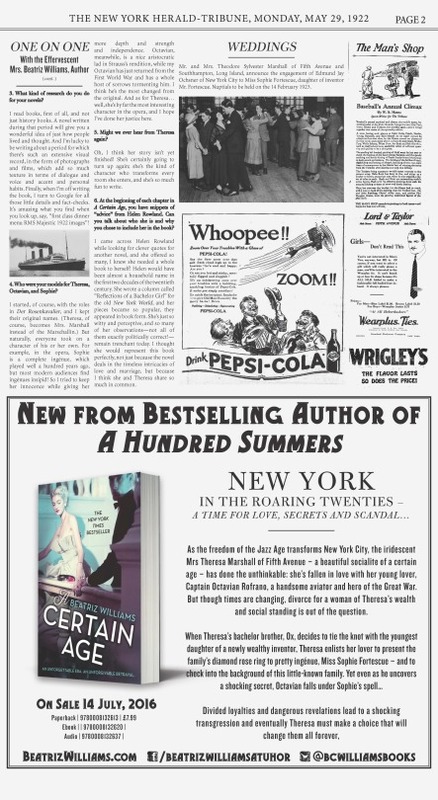 Beatriz kindly answered some questions for me about this highly entertaining novel set in one of my favourite eras, the 1920s and favourite cities, New York. The period of the 1920s seems eternally interesting to audiences. In the UK recently we’ve had Downton Abbey and Mr Selfridge on television that have both strayed into this era and been very popular. What do you see as the appeal of this decade and what have you found to be most interesting to explore within it? Oh, it was such an extraordinary decade – it’s the place where we transformed into the culture we are today. Every single strand of civilization underwent change, sometimes radical change, during the years following the war: fashion, media, sexual relationships, gender roles, music, art, literature, technology. We became modern. And you can’t explore one thing without exploring others, because all these trends influenced each other. Of course, in America, the really massive change came through Prohibition, which changed manners and social customs in such profound ways, which has to be a backdrop to any story you write about this period. But I think what interested me most, and certainly in the context of A Certain Age, was the rise of youth culture and the discredit heaped upon the older generation. Young people became the centre of the universe in the 1920s, and youth-worship remains the order of the day almost a century on. How do you feel that the shadow of the First World War is manifested in the lives of your characters in this book? Well, for Octavian, who flew combat aircraft during the war, it’s simply a part of who he is. Aviators had just about the highest casualty rates of any category of service; you were lucky to survive six weeks during certain periods, and he returns from France a lost man, though he keeps all that torment on the inside, as you did back then. Meanwhile, his lover Theresa has lost a beloved son to the war, so she’s grieving as well, and it’s no coincidence that they’ve come together to discover comfort from this misery in each other. Sophie’s the only one who’s largely unscathed by the war, and her innocence—at a time when so little innocence remained in the world—is part of her appeal. The war’s shadow looms over everything in those years; you can’t escape it, and most of what we consider the defining characteristics of that era are just a human response to the catastrophe that befell Europe. Nothing mattered anymore, so you might as well dance on the grave of the old world. When you were researching this period and, in particular, how people spoke and wrote to each other, how did you seek to approximate this in your own style and dialogue? And speaking as an historical novelist, do you feel we can ever be true to the language of the past? Ah, this is such an interesting question! Voice is absolutely vital to me, but on the other hand you can’t just replicate period language; for one thing, it’s technically impossible because we haven’t lived it, and for another thing, it has to be understood and absorbed by a modern reader. So I try to go back to original sources—novels, films, diaries, letters—to get the music started in my head, and I try to capture the words and the beats, and the way people actually thought about the world around them, the customs and manners that guided them. That’s vital. And then I channel all that through the filter of the character herself, social background and brains and personality, and that’s what appears on the page. The journalist and humourist Helen Rowland features in your book in her epigraphs at the beginning of chapters. Tell us about her and how you came across her. As usually happens, I stumbled on Helen accidentally while looking for something else! I was researching quotes about love and marriage for another book, and I uncovered this trove of wit from Helen’s syndicated column, “Reflections of a Bachelor Girl,” which she wrote about a hundred years ago. She was like the Carrie Bradshaw of her day, and yet her one-liners still have zing and relevance. Can you tell us what part opera plays in the genesis of this novel? It’s no secret that I adapted the plot and characters directly from Richard Strauss’s poignant, bittersweet masterpiece Der Rosenkavalier, first performed in 1911, which tells the story of a worldly 18th century Viennese aristocrat and her young lover, who ends up falling for the ingénue he’s supposed to court on behalf of his paramour’s cousin. I’ve always loved the way this triangle plays out, and the same themes develop so beautifully in the context of the 1920s. That being said, a novel requires considerably more narrative oomph than a three-act comic opera, so I created a murder mystery of my own to drive the action forward, and provide a more compelling pretext for the attraction between Octavian and Sophie. The narration is split between Theresa 1st person, Sophie 3rd person (both in present tense), newspaper articles and some direct address to the reader e.g. rhetorical questions. I’m fascinated by how these narrative choices came about. Did you experiment with different voices? How did you write them – chronologically, or each voice’s narrative line separately? 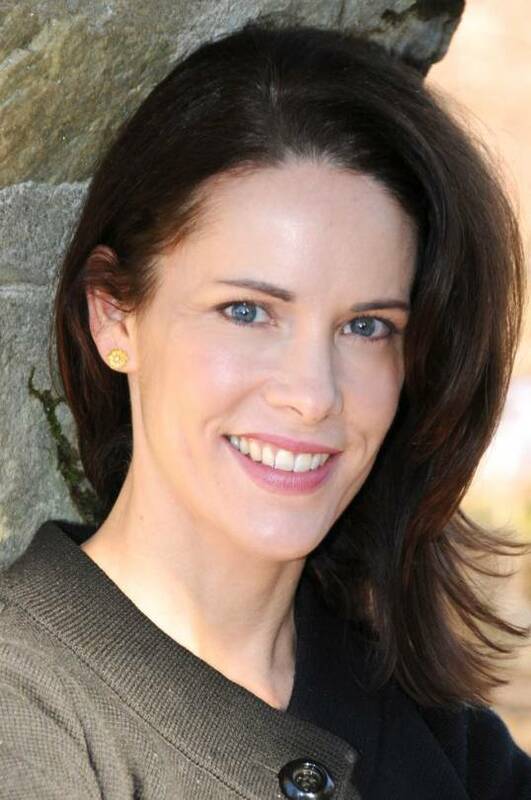 I knew from the beginning that I wanted to tell this story from the perspective of the two women, Theresa and Sophie, and I presented Theresa in the first person in order to set her narrative apart from Sophie and to draw the reader into intimacy with her, since I knew would be the most complicated, pivotal character. But both perspectives come from inside the character’s head, narrating the story to the reader in her particular voice, which is a device I use in most of my books to create a direct relationship between reader and character, which engages the reader more actively in the story – deciding whether the character’s telling you the truth, for example, or whether she really means what she says. It just adds another dimension to the process of characterization. Now, typically when I’m writing multiple narratives, I write one all the way through and then build the other one around it, but this time the two narratives take place during the same time period, so I ended up writing the book in sequence, alternating perspective with each chapter – a new technique for me, but it proved less challenging than I feared. Of course, in the meantime, I also had a fairly complex murder to explain without drawing too much attention away from the love triangle, which had to remain the focus of the book, so I came up with the device of the newspaper articles to handle all this plotting without slowing down or interfering with the primary narrative. 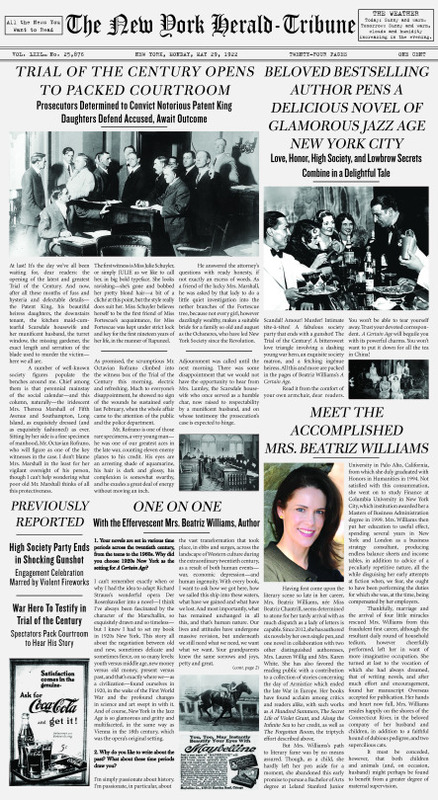 And then, at the end, the articles themselves ended up as part of the story, so it all tied together! What appeals to you and what are the challenges of using characters in your novels and crafting new narratives about them in other books you’ve written? I think one of the hardest parts of starting a new book is leaving behind the characters from the previous one, which – if you’ve done it right, anyway! – have become such a part of your life. When I wrote The Secret Life of Violet Grant, I was still hung over from writing A Hundred Summers, and I felt that the Schuyler family still had so many stories to tell, so much unfinished business! So I made Violet and Vivian into Schuylers, and suddenly everything about them made sense. I felt like I already knew them. It just drives my creativity, this building on my existing world; at this point, the only challenge is keeping track of everybody’s ages and vital statistics! So I’ve created a Schuyler family tree for my website, and it looks like I’ll have to start making one for the Marshall family from A Certain Age, who will also be making their way into future books. I loved the chapter when Sophie goes flying! I’ve just finished writing a novel about an Edwardian aviatrix and went flying in a light aircraft as research. I’ve just asked Homer Hickam the same question – did you go flying in a small aircraft and if so, what was it like for you? If not, how did you find researching this scene? Oh, I’m so glad you liked that scene! It was such a joy to write. I didn’t actually go up for research purposes; I just drew on my experience some time ago with my father, who used to fly gliders. I went up with the tow planes a few times, and I flew in my father’s glider, and luckily I have a good memory. The rest is imagination, and the pleasure I take in flying past Manhattan whenever I land at one of the New York airports. Can you share with us anything about your next book and also what you’re writing at the moment? Thanks to Beatriz for her fascinating answers. 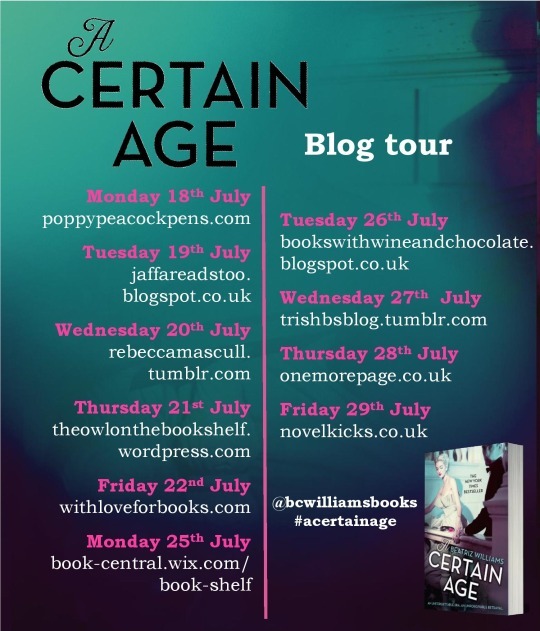 Do check out the other stops on the blog tour.